In real life I work in the subset of chemical industry where some materials only recently were subject of patents and, as a result, bore uniqueness and were in position to extract significant value to their owners. Once those compounds came off the patents floodgates opened and every decent manufacturer, Chinese and otherwise, came rushing in trying to offer their own set. In the process, some of those second-wavers survived, others perished, and those who did survive offered at least some special features which made theirs products attractive. Black atmospheric metal can be loosely compared to the above situation. Once a novelty, a subject of the elite listeners at some point, the genre is densely populated by now. Into this crowded field Dutch duo Laster is trying to make their contribution in the form of the short MCD titled Wijsgeer & Narreman. Inspired by the literature works of Goethe (Faust, I presume), the duo of N. and W. Damiaen travels the realm not of the woods and tiny brooks, but rather delves into more personal struggles’ issues, even if their material is not entirely bedroom claustrophobia. More suitable for dark abandoned medieval castle halls, the music on Wijsgeer & Narreman, especially its first two tracks, is that familiar cavernous, fuzzed out wall of sound with melodies cavitating somewhere up above, accented by periodic double bass outbursts. In levenskolken, in dadenstorm is not just melancholic, but also with a certain degree of sideways grimness in its stare. Tot eenheid verweven opens up with a lazy blast and is a more straightforward tragedy/melancholy, W. Damiaen wild banshee howls punching the fabric inside out. The closing title track is the most interesting of the three, presenting its swirling riffs as one mesmerizing waltz. The acoustic breakdown doesn’t provide any respite, and the song finishes both tragically and triumphantly, depending on how one feels at the moment, with one prominent dominating solo. The first listen to Wijsgeer & Narreman only garnered an another “me-too” reaction. 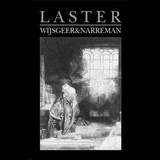 Outside of the obvious Burzum and Xasthur references I could rattle off a number of bands I could compare to Laster, who may or may not be familiar to our readers. Brocken Moon, Sorgeldom, Draugsang, Mortualia and Verdunkeln, if those names mean anything to you, Laster will fit your bill. With time, however, the MCD is economical 20 min or so and that helped to spin it many times, I have learned to appreciate Laster’s finer points, and think that out of those many who are now populating the depressive portion of black metal, they may have enough of the special features to survive. The first full-length will show where they are heading.